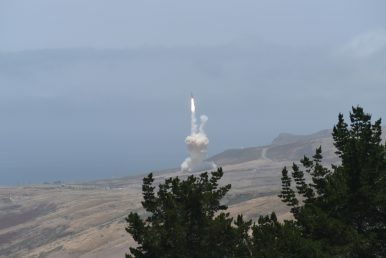 The test marks the second-ever successful U.S. missile defense test against an ICBM-class target. On Monday, the U.S. Missile Defense Agency (MDA) conducted the first-ever test of its Ground-based Midcourse Defense (GMD) system against an intercontinental-range ballistic missile (ICBM) class target using a salvo of multiple interceptors. The test was a success, MDA said in a press release. “This was the first GBI salvo intercept of a complex, threat-representative ICBM target, and it was a critical milestone,” said MDA Director Air Force Lt. Gen. Samuel A. Greaves in a statement. “The system worked exactly as it was designed to do, and the results of this test provide evidence of the practicable use of the salvo doctrine within missile defense,” he added. The salvo of two interceptors was launched from Vandenberg Air Force Base in California while the target ICBM was launched from the Kwajalein Atoll in the Marshall Islands. Monday’s test involved the firing of two Ground-Based Interceptors at an ICBM-class target to simulate a possible operational scenario involving the GMD system, which is today the only missile defense system in the U.S. inventory that is capable of intercepting ICBMs. The test validated a “double tap” style engagement, where the first interceptor successful struck the incoming target reentry vehicle. The second interceptor “then looked at the resulting debris and remaining objects, and, not finding any other reentry vehicles, selected the next ‘most lethal object’ it could identify, and struck that, precisely as it was designed to do,” MDA noted in its statement. The test, codenamed FTG-11 by the agency, saw the use of two different variants of the GBI. One was likely a three-stage CE-II Block I GBI and the other was a three-stage CE-II, according to the agency’s fiscal year 2019 budget submission. “During the test, space, ground and sea-based BMDS sensors provided real-time target acquisition and tracking data to the Command, Control, Battle Management and Communication (C2BMC) system,” MDA noted. The U.S. government has claimed that the GMD system is designed to only manage ICBM threats from countries like North Korea, which has already flight-tested two separate ICBM designs, and Iran, which has yet to test any missile of that range. Since its deployment, the GMD system has been successful in five out of 11 tests. ICBMs are defined by the U.S. government as any ballistic missile with a range capability in excess of 5,500 kilometers. The target missile used in Monday’s test was not disclosed, but the Missile Defense Agency used a target missile with a 5,800 kilometer range during last year’s FTG-15 test, which was the first-ever test of GMD against an ICBM-class target. “GMD employs integrated communications networks, fire control systems, globally deployed sensors and Ground-Based Interceptors that are capable of detecting, tracking and destroying ballistic missile threats,” the U.S. Missile Defense Agency notes on its website. Currently, the United States deploys 44 GBIs between Fort Greely, Alaska and Vandenberg Air Force Base, California. With two interceptors per missile, the system would positioned to handle as many as 22 ICBMs. If the system’s engagement mode increases to use four missiles against a single incoming target to increase the probability of a successful intercept, it would be able to handle as many as eleven ICBMs. The system’s overall effectiveness would not be increased if the design of the interceptors themselves were faulty. GBIs suffered from faulty divert thrusters, which would mean that each interceptor could have failed independently. This is the largest nominal budget request from the Missile Defense Agency ever.